This painting was done from photos I took on a misty, foggy day on the beach walking distance from my studio. The mood – especially the light coming from the partially obscured sun just out of view – recalled my experiences as a Hospice volunteer. Being present at the passing of several people from this life has affected me in a very deep and ironically uplifting way. 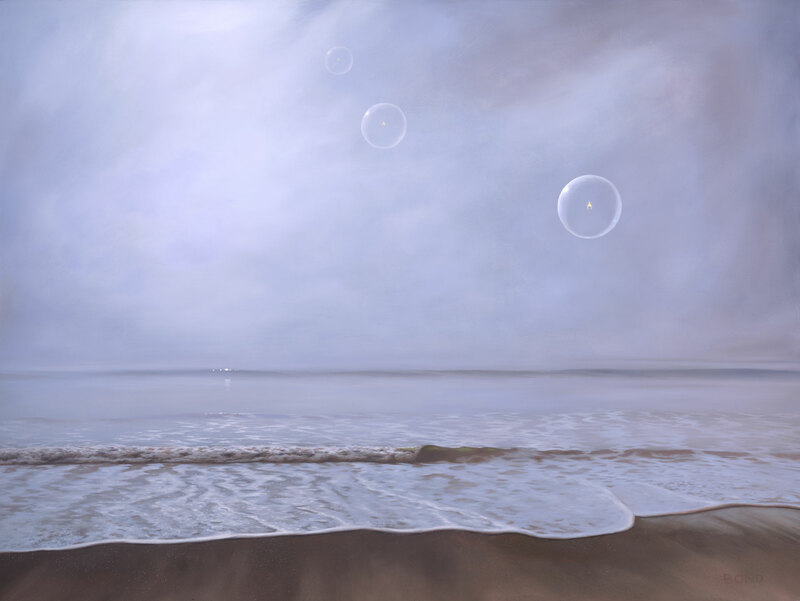 The bubbles with flames in their centers represent the souls of the departed floating peacefully out to sea. Released of all struggle and fear and limitation. This is the way I imagine death to be for the one passing on: a beautiful and liberating step into a broader awareness. Like exiting a stuffy, smoky room. Or removing a too tight pair of shoes.